Casa Tamarits is a recently renovated, modern, attractive apartment, on the second floor of a popular community; located on Javea’s famous Arenal beach area the apartment is only a 1 minute walk to the lively bars, restaurants, nightclubs and attractions, and guests also have easy access to Javea’s famous “Chiringuitos” (Beach bars) which are only a short 15 minute walk. 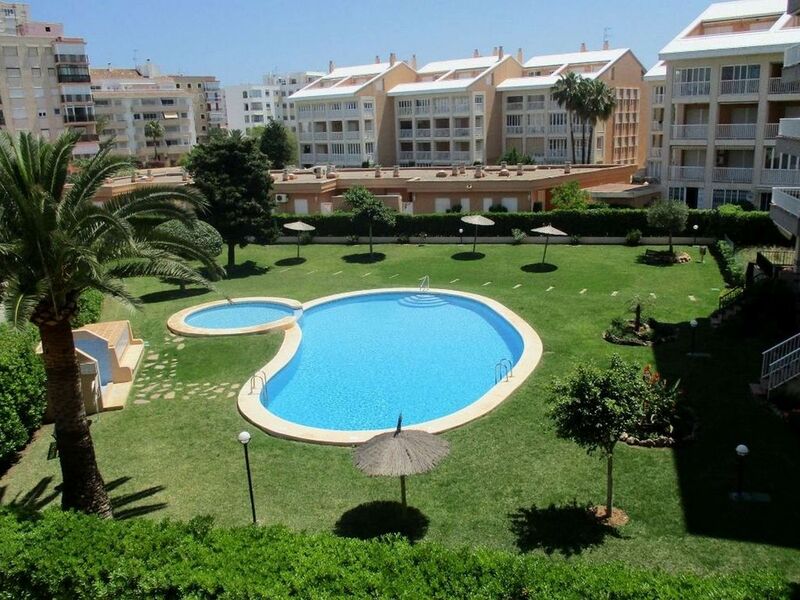 The apartment enjoys views of the large pool, children’s pool and lush grass covered gardens from the balcony terrace. The apartment is made up of 2 large bedrooms, first a king-size master and a second with 2 single beds. The apartment also benefits from a modern, well equipped kitchen ,open plan dining area and lounge, as well as 2 separate bathroom suites. The apartment entrance is protected with door intercom and has a lift to all floors; the terrace enjoys al fresco dining for 4 with wonderful views. The apartment has free Wi-Fi for guests use and also has Spanish TV. The apartment is a comfortable and relaxing contemporary space allowing a family of 4 to enjoy Javea without the need of a hire car. The kitchen is adjacent to the dining and lounge area with a large comfortable corner sofa. There is a flat screen TV with DVD and cooling ceiling fans, from the open plan lounge you can access the terrace through glass sliding doors. The bedrooms and bathrooms all lead off the hallway from the main living area; both bedrooms have ceiling fans and built in wardrobes. The apartment has no private parking but plenty of spaces on the road at the front of the apartment for guests to use. Golf:Within 10 minutes drive of the apartment is Javea Golf Club situated between Moraira and Javea and is open all year round. The course is a 9 hole, par 72 and 3,035 metres. The course is easy to play and relatively flat. Other facilities include: driving range, putting green, heated swimming pool, club bar and restaurant. The Olazabal designed La Sella Golf Course is 15 minutes drive inland near the village of Jesus Pobre. The course has 18 holes, par 72 and is 6,029 metres. The course although flat has many trees and water obstacles and presents a very good challenge. Facilities include: driving range, putting green, motorised trolleys, club bar, lounge bar, restaurant and swimming pool. Both Javea and La Sella clubs have tennis and squash courts. Within a half hour drive north in Oliva is Oliva Nova Golf Club, designed by Seve Ballesteros. This testing course 18 holes, par 72 and 7,051 metres. The club has a shop, driving range, restaurant, swimming pool and fitness centre. Ideally situated for the Arenal with great restaurants & shops. Very close to supermarket. La casa muy completa, buena ubicación. El propietario muy atento. Hemos estado muy a gusto. Estupendo apartamento, bien situado,cerca de la playa y de supermercado.Le falta algo de menaje como por ejemplo cafetera. Por lo demás todo perfecto. The beach is 100 mts from the apartment. This provides the option of all watersports such as waterskiiing, jet skies and scuba diving. There are a number of golf courses in the area and tennis clubs. Usual holiday sites to visit, for all ages. A tourist information centre close by will provide this information to help guide you on your stay. Changeovers are from 10am - 2pm on Saturdays.